﻿Paddy Power live stream horse racing from every racecourse in Ireland, including the Curragh, Fairyhouse, Punchestown, Leopardstown and Gowran Park. Watch horse racing from Ireland on Windows, iOS or Android. 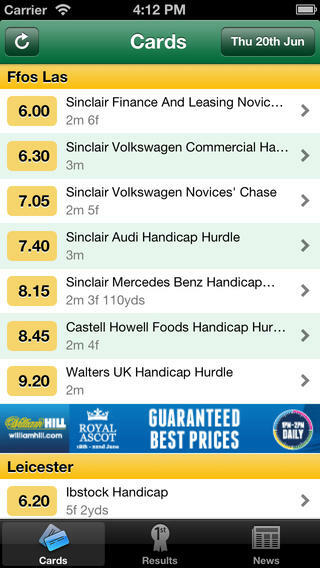 The IrishRacing.com app is available on iPhone, iPad and Android devices. The IrishRacing.com cover horse racing from both Ireland and the UK. Keep up-to-date with all the news from the IrishRacing.com website. 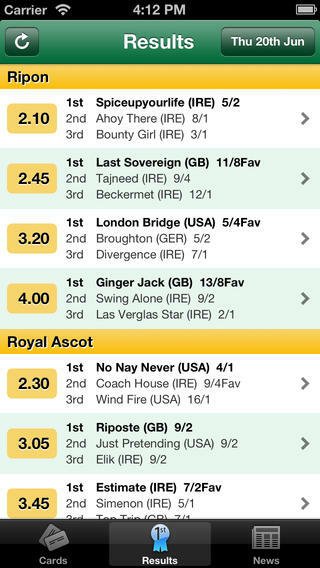 The app features live results plus a detailed race card offering in-dept horse racing details: Foal Year, Sire, Dam, Dam's Sire, Trainer, Owner, Breeder etc. 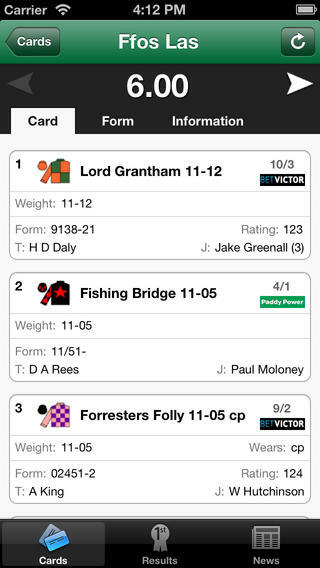 The Irish Racing app is the mobile product of the IrishRacing.com website. The Irish Times-owned platform offers full coverage of not just local horse races, but also many other British and international competitions. Get full access to the news feed from the IrishRacing.com website on your Windows Phone (Microsoft Lumia), iPhone, iPad or Android smartphone. All of this is available on mobile, as the Irish Racing app can be downloaded for free from the iOS App Store and Google Play. The first thing to see when you open the app is a list of forthcoming events in the next few days. Tap on the one you are interested in and you will see all the races for the day. Pick one and you’ll see the main race card with a list of contestants and best odds for each of them. If you want to dig even deeper, there is a profile of each horse. It shows the main characteristics of the animal, past results and form guide. There are Home and Back buttons on each page, so you can quickly return to the initial screen. You can gain access to the other Irish Racing app sections from the navigation menu in the top left corner of the Home page. The first possible choice is Fixtures. It shows a full list of races for the next couple of months. Just scroll down to see what’s coming up or use the calendar in the top right corner to select a date. The next section is called Results and as the name suggest, it contains information about past races. You can see the winners, contestants, odds and lots of other data about each horse and track. 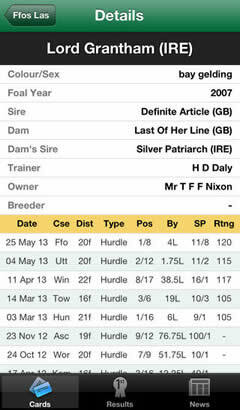 If you want to track how the Irish horses do in international races, go to the Irish Runners Abroad section. It displays a list of Irish contestants in competitions outside the country. Again, there is lots of additional information for each horse and event. 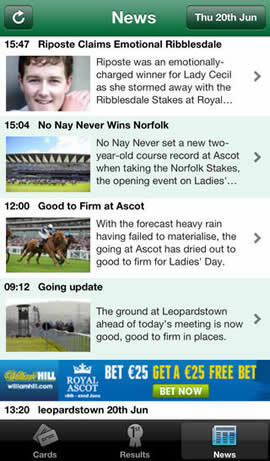 The last two parts of the Irish Racing App are for Betting Offers and News feed. You will find some promotions from the biggest bookmakers that offer horse racing and a summary of the media coverage of various competitions. The overall impression is that the Irish Racing app is a viable tool to improve your betting results and prepare for your wagers. The navigation is easy and there’s loads of information available for each horse and event. If you add the fact it’s free, you could hardly ask for more.